Whether you want to photograph a family reunion or community event or are a professional photographer covering the Olympics, the same techniques will help you capture all the major highlights. Covering big events begins with advance planning. Start by checking with the organizers to make sure you can get the access you need and to get the schedule of the event's highlights. Sometimes you can get better access by offering to provide some photographs to the organizers. 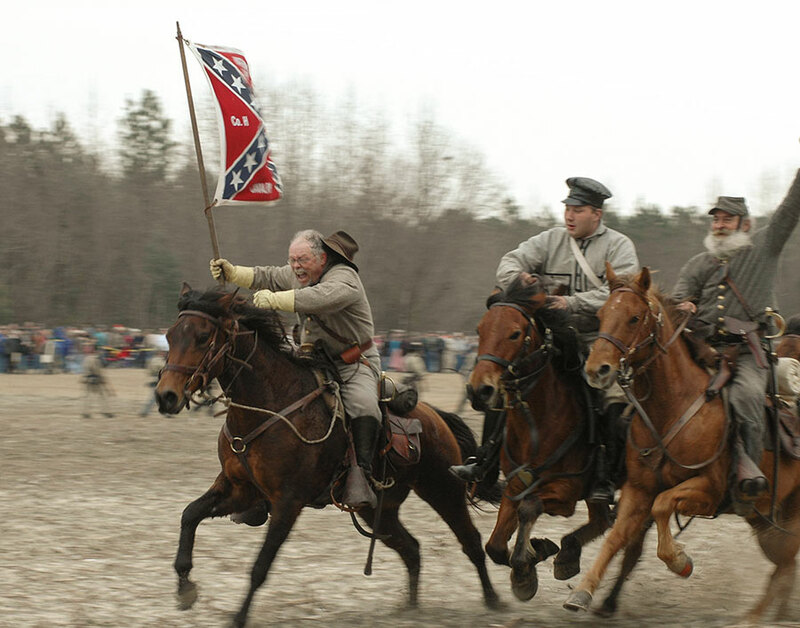 We got permission to photograph this Civil War reenactment battle in Bentonville, North Carolina, and planned out the schedule months before it occurred. 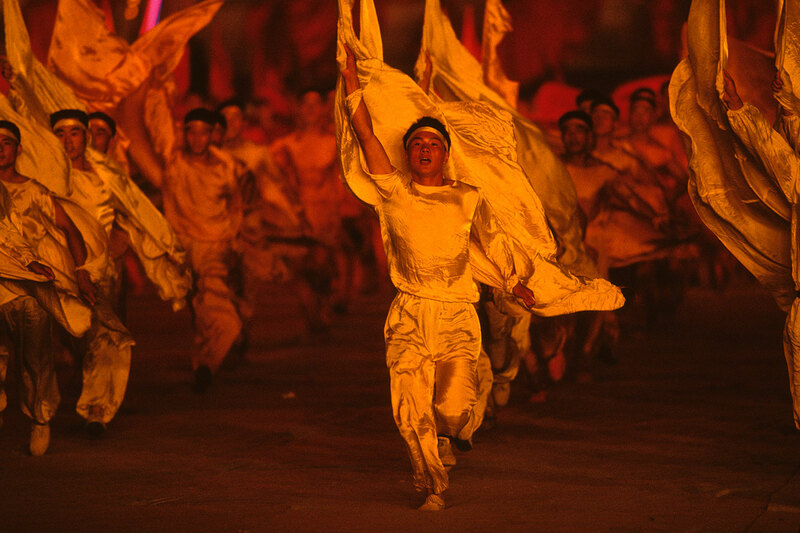 For plays, concerts or other stage events, try to get permission to shoot the rehearsal – you can usually get much better access during a rehearsal than during the actual performance when photography is often prohibited or severely restricted. 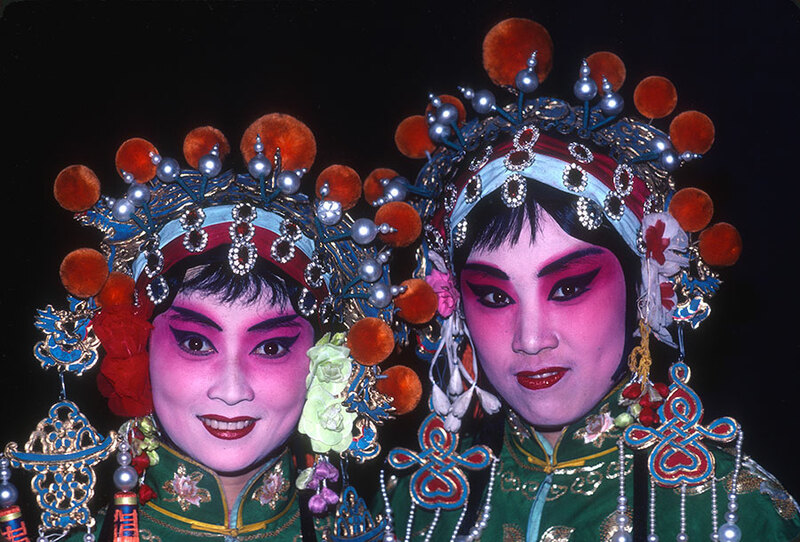 Actors posed for this photo before a Peking opera performance at a theater in Beijing, China. Go through the schedule carefully and plan out what highlights you want to cover. This is particularly important if you are shooting video, as you don’t want to shoot everything unless you have a very large post-production budget that will allow you several days to go through and edit the video down. If possible, go to the venue for the shoot and plan out your movements the day before the event. If you are part of a press corps, find out where photographers will be expected to stand and what restrictions will be placed on their movement. Draw diagrams of what will happen and where you need to stand to get the best shots. Also decide whether you will need to bring a small ladder to shoot over people’s heads in a crowd. Plan out how you will get the following shots, both from a position and equipment point of view. A long shot from head on if it’s a parade or procession. Forrest photographed this political demonstration in Beijing, China, from an overpass. A long shot from above sometimes works well when you are photographing dignitaries in a crowd who you otherwise couldn't get a clear view of. 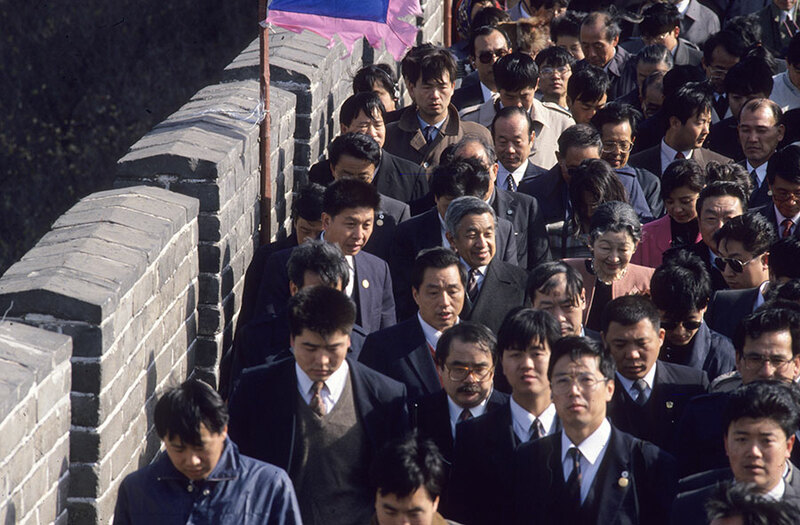 Below, this photo shows the Japanese emperor and empress on the Great Wall in China. A wide angle that shows the energy of the event and the crowd reaction. This scene shows a choir, orchestra and audience singing the Messiah in North Carolina. Close shots of the main characters or action at key moments such as handshakes over agreements or ceremonies. 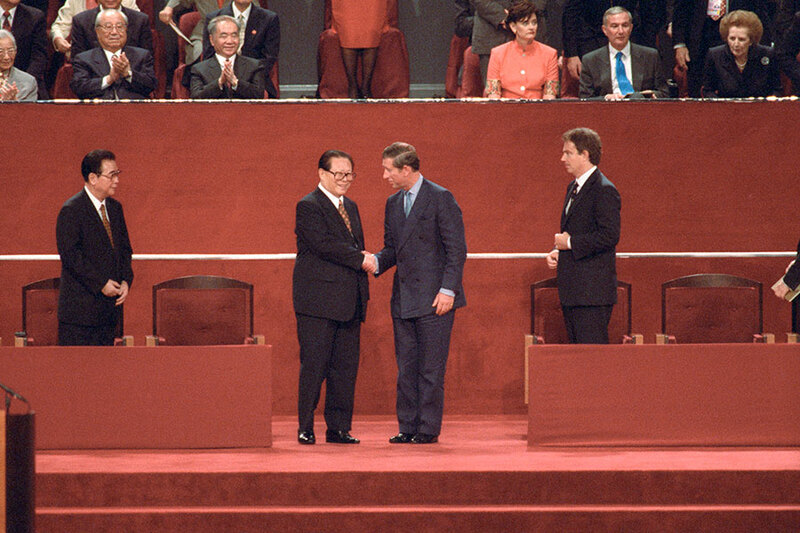 Forrest used a 600-mm lens to photograph Prince Charles and Chinese President Zhang Zemin shaking hands over the handover of Hong Kong to China. Margaret Thatcher looked on to the far right. Asides – interesting scenes that are not necessarily the main event. 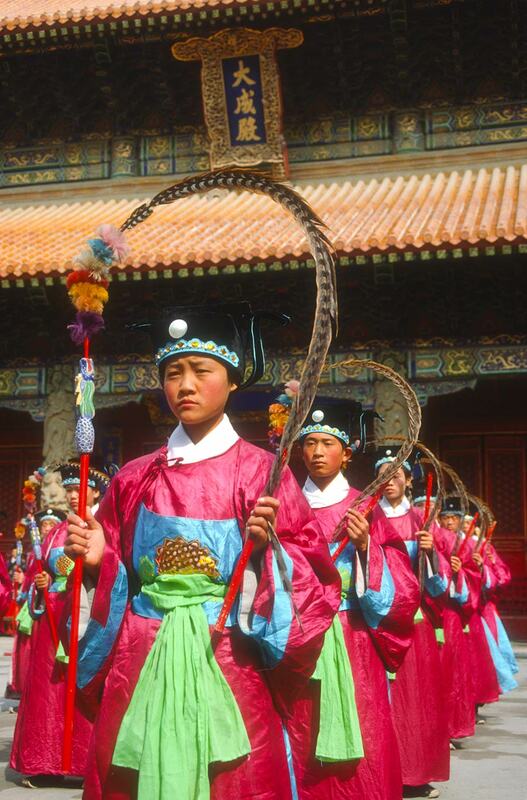 This photo shows performers at a Confucious birthday celebration in Qufu, China. Detail shots. 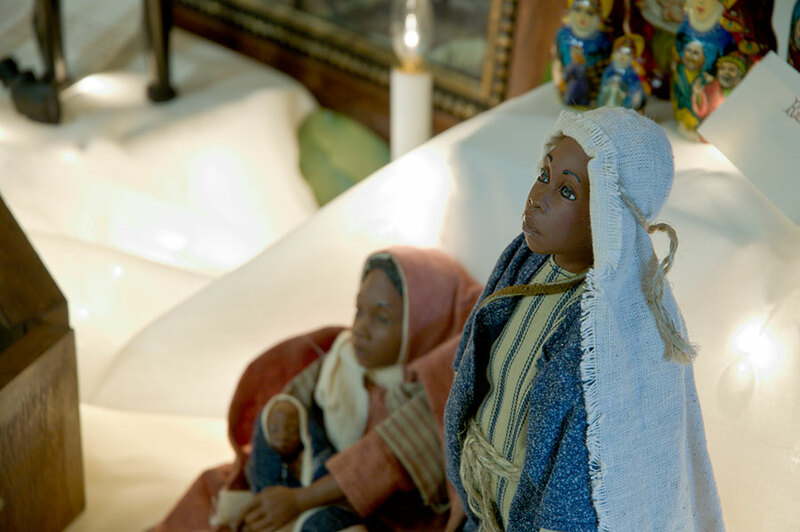 This photo of a nativity scene at a Christmas festival captures the spirit of the event. If you are shooting video, plan to get street interviews, interviews with key people, speeches and other key action as well as any meaningful backgrounds, juxtapositions or transitional movements.For video, capture good dialogue and extra sound effects and ambient noise for use in post-production. To cover a big event, you need a range of lenses, from wide to a super telephoto. It also helps to carry a small ladder for use in a crowd. Decide whether you need a tripod, which is important for video. The main point is to bring the viewer into the experience, so you need lenses that will bridge the gap between you and the action. If you are too close, it disrupts the event or calls attention to you. On the day of the event, shoot. Don’t celebrate, eat out, shop, etc. Just shoot if you want to get the best action. Arrive early and stake out your spot. If there are multiple shots, consider paying someone else to hold a spot for you. 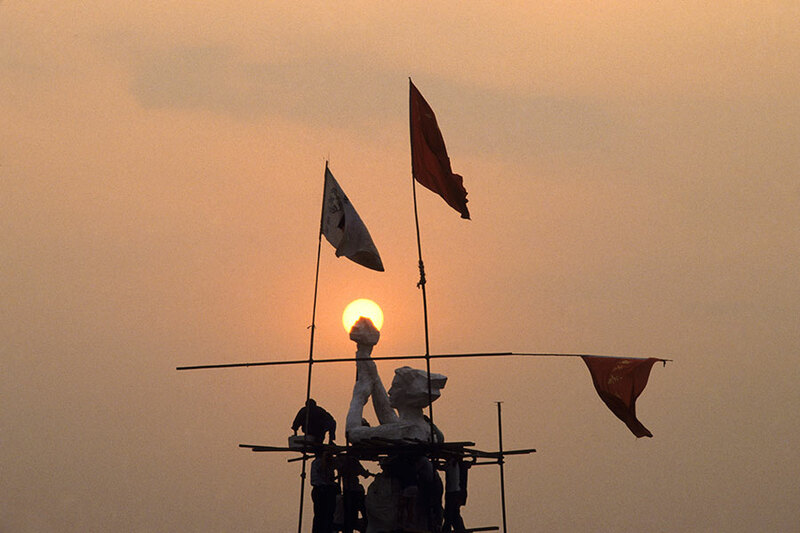 Forrest got this shot of protesters in Beijing erecting the Goddess of Democracy statue because he showed up before dawn. Go systematically from one part of the event to another, moving into position for the sequence of events. Be prepared for serendipitous surprises. This is where being fluent in the use of your equipment is important so you don’t miss unexpected action. Stay until the end. Some of the best photographs come after an event is over and other photographers have left. Sometimes dignitaries will come out after an event and you can get your best shots of them when it is over. After a meeting in Beijing, former U.S. President Richard Nixon went out on the streets in Beijing and greeted people passing by. 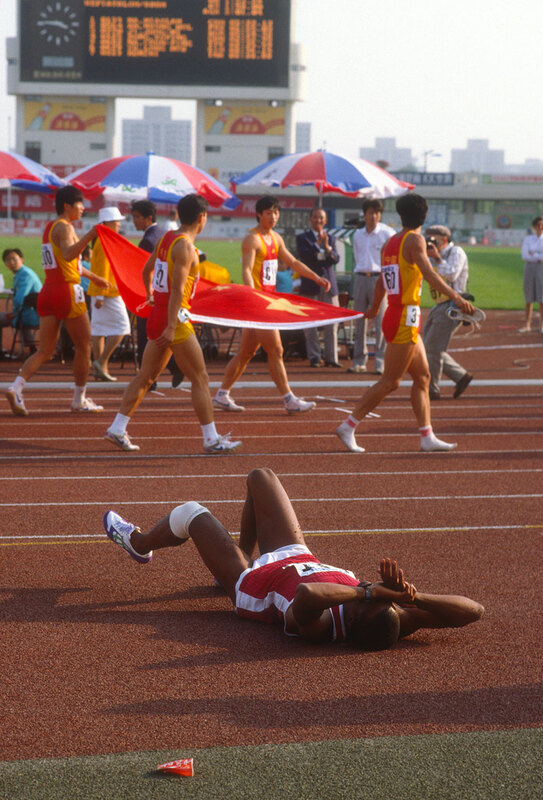 Forrest shot this picture of an injured runner laying on the track in agony as his victorious rivals took this victory lap at an international sports event.